I just had the opportunity to review the most recent release (September 29, 2017), Jetlagger, by Bette Smith and I really like it. 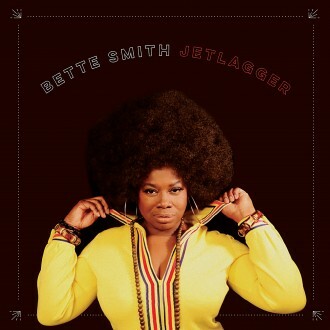 Opening with original track, I Will Feed You, a dynamic "Macy Gray" styled ballad with a really strong melody, Smith lays out what I think it a sure fire radio track. With Jimbo Mathus on guitar and keys, Bronson Tew on drums, Matt Patton on bass, Scott Goolsby on guitar, Jamison Hollister on violin, Marc Franklin & Kirk Smothers on horns, and Susan Marshall on backing vocals, the music is thick. Excellent! R&B track, Flying Sweet Angel of Joy has rich gospel like backing vocals giving this track a super richness. Jimbo Mathus' Dirty Hustlin' gets a super funk treatment and it really is strong. This track is perfect for Smith and deep backing vocals, paired with the bass/drum work and a clever guitar solo by Mathus makes it one of my favorites as well. Another Mathus penned track, Moaning Bench, has strong R&B drive with punchy horns and powerful vocals. Isaac Hayes, Do Your Thing, has a super darkness with Smith showing the lower vocal range and the bari sax and bass working nicely with the organ and drums give it just the right feel. Wrapping the release is City In The Sky, another solid R&B track with a beefy bass line. Smith's vocals are sure and Mathus' guitar work has a nice looseness further showcasing just how strong Smith is. I really like this release. If you want a rich earful of soulful music...this is it!